Our main focus of attention with rhododendron plants is with the part above ground level; the leaves, flowers and plant architecture. Apart from problems with root diseases we generally pay little attention to roots. In rhododendrons and other ericales the root system consists of a network of fine roots called hair roots; this is a typical characteristic of these plants. Another less well known feature of these hair roots is their intimate association with specialized fungi. These colonized roots are called mycorrhizal roots. The association is so well established that it is difficult to imagine rhododendrons without their helpful subterranean partners. Formation of mycorrhizas alters the branching pattern in roots and also facilitates the regulation of water and nutrient supply to the plant. They may also confer tolerance to adverse soil conditions such as toxic metals and provide some defense against invading root pathogens. Root systems which bear fungi in specific physical configurations are called mycorrhizal roots. The association is mutually beneficial to the plant (via roots) and the fungus. The plant is called the host and the fungus the symbiont. Classification of mycorrhizas is based upon the way in which the fungal hyphae are associated with root cells. Thus with ectomycorrhizas a dense sheath of mycelium surrounds the roots and hyphae penetrate between cells as far as one or two layers of cells. With endomycorrhizas the fungus enters into cells of the root's epidermis or cortex. The mycorrhizas of rhododendron belong to a special category of this latter class. All members of the rhododendron family have a characteristic type of mycorrhizal association called ericoid infection (Harley 1969). This type of mycorrhiza is also found in most members of the Ericaceae including Calluna , Erica , Gaultheria and Vaccinium . The fungal symbiont typically grows loosely around the surface of new roots at first but quickly penetrates individual mature cells of the cortex, (Fig. 1). Since Rhododendron roots consist of only a few layers of cortical cells and lack an epidermis an infected root gives the appearance of being fully invaded by the fungus (Fig. 1). In contrast, when plantlets are grown in the absence of fungi, their root cells are not infected (Fig. 2). The fungus grows abundantly within individually infected cells and each cell appears filled with strands of hyphae (Fig. 3). The association of symbiont with its host seems finely controlled since fungal hyphae are not found in the central conducting vessels of the stele (Fig. 1) or in cells of the tip of growing roots. Formation of a corky layer in older root systems also excludes the fungus. exterior to root cells; x 500. Inset shows a lateral rootlet with associated wefts of hyphae; x 40.
showing intracellular hyphae and some cells which are not infected asterix; x 1300. Fig. 4.
the tip and spores; x 400. Our knowledge of the fungal partner in this extraordinary relationship is still rather poor. Early studies attempted to isolate the fungus from the roots followed by fungal identification. However, proof of mycorrhizal status requires that any fungus isolated should produce typical mycorrhizal roots when re-associated under sterile conditions. For this it is necessary to have a sterile compost (substrate) and plants (usually surface sterilized seeds). In 1974 Dr. David Read isolated a fungus from roots of Calluna vulgaris . It was dark pigmented and slow growing and was proven to be mycorrhizal. It produced apothecia in associations and was classified as Pezizella ericae . This organism was later isolated from Rhododendron ponticum by Dr. Jane Duddridge (1980). Around this time our laboratory had developed a micropropagation system for commercial cultivars of rhododendron (Douglas, 1984). The availability of such a convenient source of sterile plantlets was ideal for testing if divese fungi which were isolated from Rhododendron roots were capable of forming mycorrhizas. In this way and with the assistance of the Research Foundation of the American Rhododendron Society we set out to isolate and characterize the fungal partner(s) in rhododendron roots. Rhododendron roots were collected, washed, surface sterilized in sodium hypochlorite, rinsed and macerated. The resulting suspension was plated out on water agar. After 10 days fungi began to grow out on the agar. From previous experiences we discarded most of the fast growing fungi among these cultures and selected 12 isolates which were slow growing and black brown in colour. Each of the 12 fungal isolates obtained from rhododendron roots were tested for their potential to form mycorrhizas. Only one isolate proved mycorrhizal. Characteristically it infected root cells and produced spore forming conidiophores (Fig. 4). The method of testing fungi is illustrated in Fig. 5. A small piece of agar bearing hyphae was placed on the supporting filter paper near roots and samples of roots were taken at intervals for microscopical examination. Scanning electron micrographs revealed details of the cross section of roots (Fig. 6) and also the close association between hyphal strands and the surface of root cells (Fig. 7). The successful strain of fungus which we obtained was classified later as Oidiodendron maius . Production of conidiophores and spores (Fig. 8) facilitated its identification. We later confirmed that hyphae were within root cells using the transmission electron microscope. The main structural features observed were typical of ericoid mycorrhizas (Fig. 9). More details of ultra structural and other aspects are given elsewhere (Douglas etal. 1989). This represents the first time that Oidiodendron maius has been isolated from roots and proven to be mycorrhizal with rhododendron or any other Ericoid plant. on the filter paper bridge to colonize the root system; x 0.8. Fig. 6. Scanning electron micrograph (SEM) of a root section showing the distribution of cells; x 660.
a hyphal tip had penetrated the cell wall (arrow);x 2100.
arrowheads, n denotes the host nucleus; x 2700. In pure culture growth rate of O. maius was slow, achieving 1.5 mm of radial growth per day on all media tested. On cherry agar there was abundant aerial mycelial growth with colony centre grey/green becoming pale towards the edge. The undersurface was cracked and similar in colour to the surface. On malt agar colony colour was fawn green rising from the substrate while on potato dextrose agar colony colour was black with profuse aerial hyphae. Oidiodendron species were considered as common soil saprophytes until recently when the mycorrhizal status of O. griseum was proven on Vaccinium roots (Couture et al. 1983). Subsequently O. rhodogenum and O. cerealis were isolated and produced typical mycorrhizal roots with Vaccinium whereas O. truncation and O. tenuissimum did not. (Dalpe, 1986). In our own study the formation of mycorrhizal roots with O. maius on rhododendron occurred in 65% of roots examined, and occurred very rapidly, within 10 days. In previous studies with rhododendron and the fungus Pezizella ericae four weeks were required for first infections to occur (Duddridge & Read, 1982). With Vaccinium 60 days of incubation were necessary to achieve 9 to 21% infection (Dalpe, 1986). We attribute our success to the system of culturing the plantlet and fungal inoculum on a filter paper bridge (Fig. 5). This provides good aeration for growth of roots and the symbiont. By using this system it should be possible to test the compatibility of diverse isolates of potential mycorrhizal fungi with particular varieties of rhododendron, and obtain results rapidly. Micropropagation is being used increasingly for rhododendron production. This method gives microorganism free plantlets. They will become inoculated with mycorrhizal fungi if compatible fungi are present in the compost. In our experience compost based on sphagnum peat contained the fungus and the roots quickly formed mycorrhizal associations. It is probable that the fungus was present in such composts as a saprophyte or as a residue from root associations with wild ericaceous plants such as Erica and Calluna spp. It is important to realize that there may be differences among strains of these fungi in native soils. Already differences in the extent of mycorrhizal development has been found between two cultivars of rhododendron. 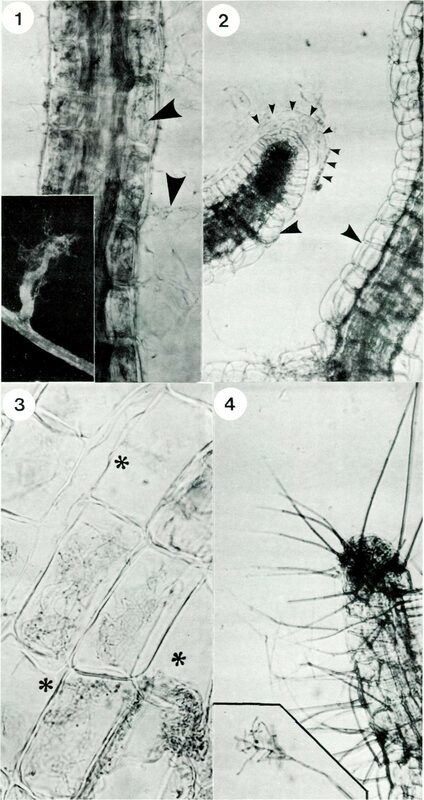 In addition, differences were noted between the rooting stage of cuttings and subsequent transplantation stages (Moore, Parkhurst and Englander, 1982). The foregoing discussion poses the following interesting questions (a) What does the fungal symbiont do for the rhododendron plant? ; (b) How important are mycorrhizas for plants grown commercially and in home gardens? ; (c) Can we regulate the performance of plants by altering or modifying the type or degree of mycorrhizal formation? Our knowledge on this subject comes largely from the work of Dr. David Read, who has written an excellent review of the subject (Read, 1983). To undertake experiments addressing these questions we need to have compost eradicated of all microorganisms so that the effects of the test fungus can be fully evaluated. Plantlets free of microorganisms can be obtained from micropropagation or surface sterilization of seeds. In early studies, compost was sterilized by autoclaving under pressure; this produced undesirable side effects such as release of nitrogen from organic composts and this complicated the interpretation of results. With gamma irradiation of compost these side effects were eliminated and it was shown that mycorrhizal plants gave a greater increase in dry matter and had significantly higher levels of nitrogen and phosphorous than un-inoculated plants of Calluna and Vaccinium (Read and Stribley, 1973). Later it was shown that the beneficial effect of mycorrhization depended on the amount of available nitrogen. Thus if the ambient levels of available nitrogen are very low the fungus benefits at the expense of the plant, whereas at intermediate to low levels mycorrhizal plants had a higher content of dry matter and nitrogen than non mycorrhizal plants. Under these conditions of restricted availability phosphorous levels in mycorrhizal plants were also higher. Most of the nitrogen and phosphorous in peat soils is present as complex organic forms. Mycorrhizal plants are capable of utilizing organic forms as sole sources of nitrogen whereas non mycorrhizal plants are not (Stribley and Read, 1974). Similarly mycorrhizal plants grew better in the presence of organic phosphate than non-mycorrhizal plants suggesting that such plants show enhanced access to the organic forms of phosphate (Mitchel and Read, 1981). Some classic experiments have indicated that nitrogen can also be stored in the hyphae of mycorrhizal roots. It is then released and transferred to the root cells or into shoots when demand is high and when seasonal levels of soil nitrogen are low (Read, 1983). Formation of mycorrhizas by ericaceous species probably facilitates their success in soils which have a low pH and high availability of zinc, aluminum and copper and in soils where common soil pathogens would normally thrive. Mycorrhizal plants grew better than non mycorrhizal plants with normally toxic levels of copper and zinc. 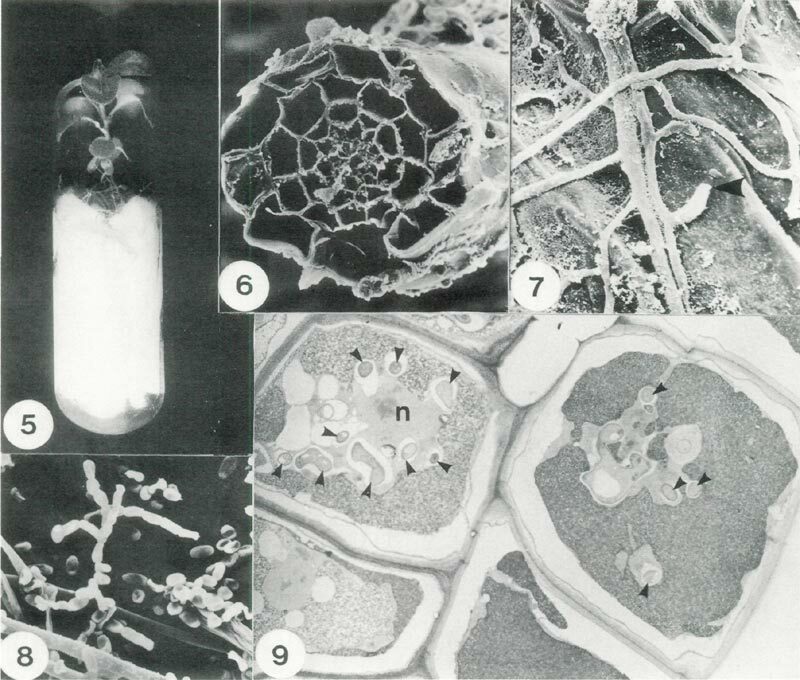 Under these conditions mycorrhizal plants exclude metals from the shoots and bind them in the root system (Read, 1983). The nature of the symbiont isolated from Rhododendron in our own study suggests a further possible role. It may act as an antagonist to root pathogens and soil borne fungi. We isolated O. maius from mycorrhizal roots of rhododendron. Previously Oidiodendron spp. have been isolated from forest soils (Barron, 1962), humus (Tokamasu, 1976), cutaway peat and the rhizosphere of Juncus (Dickinson and Dooley, 1969) and wheat (Mangan, 1967). Specifically O. maius was frequently isolated from coniferous soils (Sonderstrom and Baath, 1978) and from ectomycorrhizal roots of Sitka spruce (Schild etal, 1988). When O. maius was grown with pathogens such as Phytopthora cinnamomi and Heterobasidion annosum a clear antagonistic reaction was observed (Schild etal, 1988). Similarly a general antagonistic reaction was demonstrated between O. maius and seven different fungi derived from its original peat habitat (Dickinson and Boardman, 1970). Since these antagonistic reactions occur between pure cultures it could prove fruitful to determine if it is based on the release of chemical substances. Furthermore it may be possible to select strains of mycorrhizal fungi which afford protection to plants against pathogens such as Phytophthora cinnamomi . Other possibilities are also suggested such as artificially producing mycorrhizal strains so that they could chelate calcium ions thereby raising the pH threshold for the satisfactory growth of our much beloved rhododendrons. The science of ericoid mycorrhizas is relatively young and we anticipate interesting practical applications in the future. The following method (Peterson etal, 1980) describes how to examine ericoid roots for the presence of mycorrhizas. Equipment needed Microscope x10 x40. 2. Prepare solution of trypan (0.05% W/V) in lactophenol. 3. Place roots in lactophenol trypan blue stain (0.05%) for 10 min. at 90° C.
5. Mount in fresh lactophenol and observe in the light microscope as in Figs. 1 and 3. 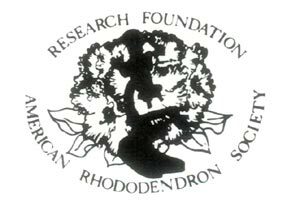 This research project was supported financially in part by a grant from the Research Foundation of the American Rhododendron Society. BARRON, G.L 1962. New species and new records of Oidiodendron . Can. J. Bot. 40:589-607. COUTURE, L.M., J.A. FORTIN and Y. DALPE. 1983. Oidiodendron griseum Robak: an endophyte of ericoid mycorrhiza in Vaccinium spp. New Phytol. 95:375-380. DALPE, Y. 1986. Axenic synthesis of ericoid mycorrhiza in Vaccinium angustifolium AIT. by Oidiodendron species. New Phytol. 103:391-396. DICKENSON, C.H. and M. DOOLEY. 1969. Fungi associated with Irish peat bogs. Proc. R.I.A. 68:109-136. DICKENSON, C.H. and F. BOARDMAN. 1970. Physiological studies of some fungi isolated from peat. Trans. Brit. Mycol. Soc. 55:293-305. DOUGLAS, G.C. 1984. Propagation of eight cultivars of Rhododendron in vitro using agar solidified and liquid media and direct rooting of shoots in vivo . Scientia Hortic. 24:337-347. DOUGLAS, G.C, M.C. HESLIN AND C. REID (1989). Isolation of Oidiodendron maius from Rhododendron and ultrastructural characterization of synthesized mycorrhizas. Can. J. Bot. 69: (In press). DUDDRIDGE, J.A. 1980. A comparative ultra structural analysis of a range of mycorrhizal associations. Ph.D. thesis, Univ. of Sheffield, Sheffield, U.K.
DUDDRIDGE, J. and D.J. READ. 1982. An ultra structural analysis of the development of mycorrhizas in Rhododendron ponticum . Can. J. Bot. 60:2345-2356. HARLEY, J.L. 1969. The biology of mycorrhiza . Leonard Hill, London. MANGAN, A. 1967. Studies on wheat rhizosphere soil fungi, Ir. J. Agr. Res. 6:914. MITCHELL, D.T. and D.J. READ. 1981. Utilization of inorganic and organic phosphates by the mycorrhizal endophytes of Vaccinium macrocarpum and Rhododendron ponticum . Trans. Brit. Mycol. Soc. 7b:255-260. MOOREPARKHURST, S. and L. ENGLANDER. 1982. Mycorrhizal status of Rhododendron spp. in commercial nurseries in Rhode Island. Can. J. Bot. 60:2342-2344. READ, D.J. 1983. The biology of mycorrhiza in the Ericales. Can. J. Bot. 61:985-1004. READ, D.J. and STRIBLEY, D.P. 1973. Effect of mycorrhizal infection on nitrogen and phosphorus nutrition of ericaceous plants. Nature (London), New. Biol. 244:81-82. SCHILD, D.E.,A. KENNEDY and M.R. STUART. 1988. Isolation of symbiont and associated fungi from ectomycorrhizas of Sitka spruce. Eur. J. For. Path. 18:51-61. SONDERSTROM, B.E. and E. BAATH. 1978. Soil micro fungi in three Swedish coniferous forests. Hoi. Ecol. 1:62-72. STRIBLEY, D.P. and D.J. READ. 1974. The biology of mycorrhiza in the Ericaceae. IV. The effect of mycorrhizal infection on uptake of 15 N from labeled soil by Vaccinium macrocarpon Ait. New Phytol. 73:1149-1163. TOKAMASU, S. 1976. On the natural habitat of Oidiodendron . Trans. Mycol. Soc. Jap. 17:99-105. G.C. Douglas, senior author, is associated with the Agriculture and Food Development Authority, Kinsealy Research Centre, Dublin; M.C. Heslin with the University College Dublin, Department of Botany, Dublin; C. Reid with Trinity College Dublin, Electron Microscope Unit, Dublin.